Theme matters. Of course theme matters. I’ve talked about how important theme is to me before, often at length. When I am playing a game, I want to be immersed, involved, enchanted. I want to be transported to its world; whatever that world may be. When I play a game, I would rather the mechanics not to be naked. Rather than thinking about collecting resources and managing my hand, I want to be struggling to get enough food to feed my villagers, and agonising over what the best use of my time is in order to keep them fed into the next turn. You can draw a perfect analogy with story here, whether it be film, television, comics, or movies. They all have a plot – a series of mechanisms to move things forward, interest us in the characters, and help things to make sense. But the plot should be hidden behind the story. If the story is good enough, it will draw an entrancing veil over the plot. A game is a much more of fun experience if I am immersed in it, and engaging with the other players in it, rather than outside or around it. Some games do this well, and occasionally games do this exceptionally well. There is an odd blind spot, though, even in games that are otherwise excellent examples of marriage between theme and mechanics. And that blind spot, that bane of so many board games, that spoiler of theme, and destroyer of worlds is so often victory points. Small though that element is, it is what ties up the game; it is what everyone aims for, and thus thinks about during the game. It is not confined to the end, but seeps into the whole experience. If, during a game, you are building a civilisation – be that village or empire – there is surely a better metric for success than ‘victory points’. I understand the difficulty that is presented here. In any reasonably complex game you will be playing towards several goals – building, gathering, exploring, currency – and there has to be some method of measuring everything together at the end. And neither am I saying that adding together elements at the end is a bad thing either. Games where the winner is obvious before the end become boring and frustrating for the other players. The idea of a victory points track in and of itself is a solid mechanic. But like every other mechanic in thematic games, it needs to fit into the world of the game. In a thematic game, players should not feel like they are playing cards or rolling dice, they should always feel like they are committing crucial resources and hoping to beat the odds. So it is odd to me that victory points is so often overlooked, as though it is just a given, a mechanic set in stone that is not thought about during development. In other news, we’re on Instagram now! We’re putting up pictures of games we play (if we enjoy them and they look pretty) so you can follow us there. I never thought how much of a let down “most victory points” could be, but you’re right. One of our current faves is Xia:Legends of a Drift System and the “victory points” there are “fame points”. This ties into the flavor better as you are getting more famous by your deeds and thus earn fame titles as you go. It’s like you’ve opened my eyes. I hope I haven’t ruined your enjoyment of otherwise good games! I have a lot about Xia, and I think it’s a game we would like a lot, but I haven’t ever seen it anywhere. Not yet, anyway. Even a small change like changing ‘victory’ to ‘fame’ makes a difference, though, if that ties into the theme better. The Pursuit of Happiness calls them “Long Term Happiness”, and the thematic connection is there: They also have a per-turn “short term happiness” which acts as a modifier for resource costs for projects and decides first player, but is returned to the middle every turn. I don’t think I have ever heard of that game! 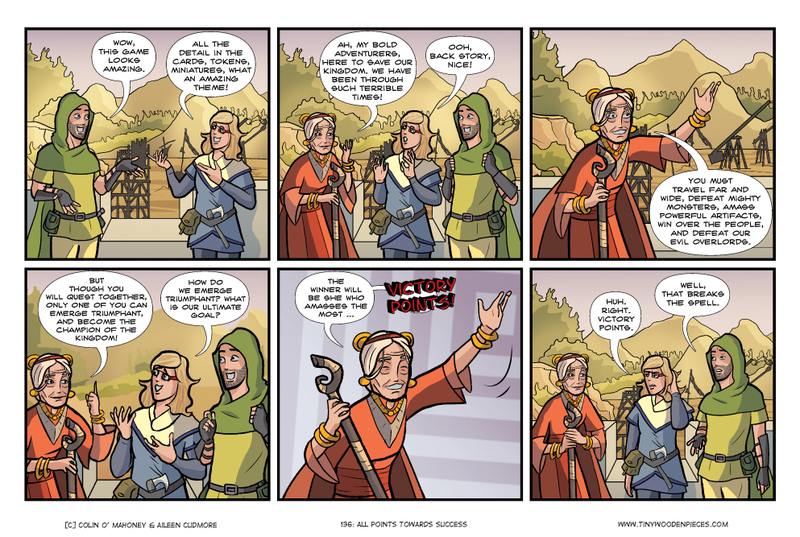 I like the idea that the victory points have a function that ties them into the game, though. It sounds interesting, and a good way to avoid the issue I was talking about. I’m with you on this. It’s one of my few bug bears with games like Takenoko; visually gorgeous, dynamic, and engaging. In the end, however, it’s just down to who collected the most points on cards, and that’s always been something of an anti climax for me. Some games handle it super well, despite it still being clearly a points thing. Gloom is entirely based on how many points you can stack before the game ends, but it’s more about the journey than the total. You remember those 15 points you scored for being badgered by badgers, but the score itself feels like a by product. I guess it’s difficult to interweave in games without having a knockout or objective only win condition, which bring their own problems with play experience. Still, it’d be nice to see more attempts at it. It’s an idea for a comic that had been knocking around my head for a long time, and I thought about it a lot while writing the blog post as well, and I don’t think there is an easy answer to this. In most instances, a victory points track is better than a knock out win condition, as you say, but managing this in a more thematic way is the difficulty. Came across it most recently in Lords of Waterdeep, where despite the great theme and setting, the ending was just tallying up points. Many of my favorite games have victory points but call them something more thematic. For example, in Brew Crafters you are competing for “reputation” of your brewery, which you earn by brewing and selling beer, hiring particular specialized workers that give you reputation for certain actions, improving your property, etc. Even calling them by a different name makes a difference! Especially if what you are doing during the game ties into that name – in the example you gave that does seem to be the case. And that actually seems to be a simple fix for the issue, in that instance at least. What are the games you mentioned that tied everything together exceptionally well? Pretty much any version of Pandemic, but now that I think about it, co-op games have an easier time in this regard, as you it tends to be an win/lose situation against the game. Machi Kori is a lovely example: the money you earn is put towards certain ‘landmark’ buildings that make your city stand out, and the first person to have all four of these landmark structures wins. Game of Thrones has an excellent system, and I think Scythe manages really well to dress the victory points in theme just enough that it doesn’t feel like counting points, but deciding which faction was the most popular/strongest. Really though, it does seem to me that most of the games that I think tie mechanics and theme perfectly are co-op: Ghost Stories, Sherlock Holmes: Consulting Detective.